Every locksmith service aims at solving different problems. Accuracy is needed for all of them but it’s also important to know exactly what to do and what measures to take to ensure maximum security. The professionalism of our teams at Calgary Locksmiths guarantees the best service! Whether there is need for just lock repair or our customers request 24/7 replacement of vandalized locks, we will be there to serve your needs efficaciously. There is no limitation to what we can offer and you can also be sure that the technical teams of our company are the best in Alberta. Locksmith services are offered at the convenience of each client and always aim at eliminating issues once and for all. 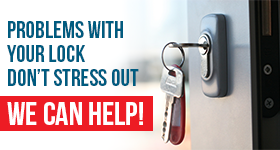 When the cylinder turns and the key is stiff, the strike damaged and the lock filthy, we’ll be there for services. Our residential and office locksmith teams take care of repairs needed with great care but they will also try out the new key cut in their vans and suggest new ideas for the security of one’s office. Our services cover all needs related to security. We are experts in bolts and will also install supplementary systems, change the locks of cabinets, repair the door closer and install a new safe. Anything that can guarantee security falls into the responsibilities of our Calgary Locksmith Service. Offering 24 hour locksmith is part of our job. We actually consider it our duty to respond to people’s needs 24/7 since we are the experts in lock change and repair and know how to replace the faulty bolts. Our 24 hour teams in Calgary are fast and extremely competent. The vans of our company are prepared and can serve any need. With our exceptional organization and professionalism you can be sure that our Locksmith Service in Calgary will cover your personal needs completely.